Generational definitions of millennial tend to be too broad. As our company’s housing demographer, I am responsible for bringing clarity on these categories to our clients. Here are two great charts and five interesting conclusions on household formation and homeownership today. Household formation rises an average of 5.4% per year during your 20s. 13% of 20-year-olds head a household today, compared to 67% of 30-year-olds and 79% of 36-year-olds¹. Homeownership rises an average of 3.0% per year during your 20s. Only 8% of 20-year-old householders own a home today, compared to 38% of 30-year-olds and 52% of 36-year-olds². 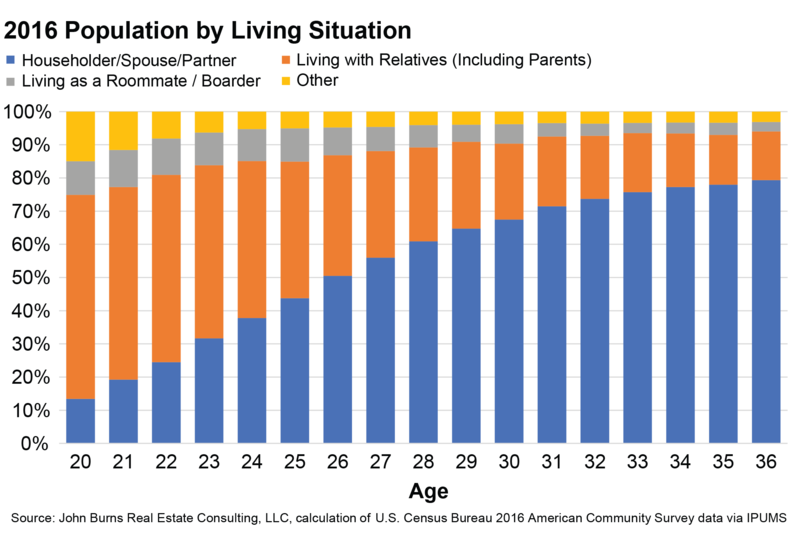 5% more likely to be living with parents at age 36. 15% of 36-year-olds live with parents/relatives at age 36, compared to just 10% of 36-year-olds ten years prior. Forming households two years later. 50% of young adults now head a home by age 26, compared to 50% heading a home by age 24 in 2006. Buying a home five years later. Homeownership reaches 50% by age 36 today, compared to 50% homeownership at age of 31 in 2006. Remember that 2006 had levels of homeownership that may never be achieved again. So what to do with all of this? Make better housing demand conclusions. Know the life experiences of your target tenant or buyer. Don’t consider all millennials to be the same. The 1990s Connectors born in 1995 owned just over 56,000 homes in 2016, while the 1980s Sharers born in 1985 owned more than 800,000 homes. Simplify your decision-making using our 4-5-6 rule. 4 disruptors. Government policies, economic cycles, new technologies, and shifts in social acceptability have made dramatic changes to household formation and homeownership. 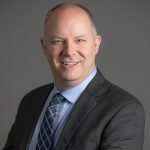 Government policies, new technologies, and societal shifts seem to be changing more rapidly than ever. 5 life stages. Each of those disruptors is impacting people differently whether they are young adults, families, or older. The emergence of ride sharing has impacted young adults much differently than families and retirees. 6 questions. Use our rule to maximize your revenue by clarifying the who, what, when, where, why, and how you will succeed. Call, email, text, fill out a form or chatbot us (depending on your generation 😊) to learn how you can better capitalize on these trends in your local market. ¹We consider couples living together to both be heading a home. 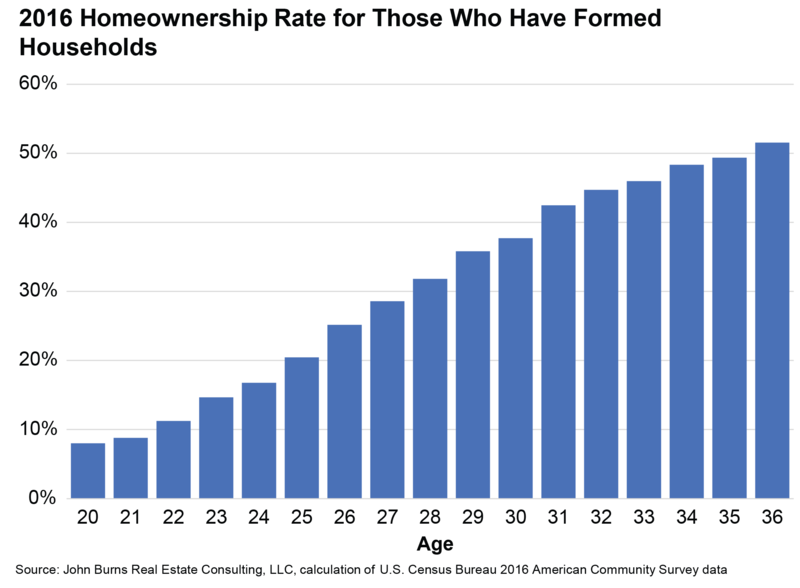 ²The percentage of people owning a home is actually lower, as homeownership rates are the percentage of households who own and not the % of people who own.